Purple Hippie Granola wants to take up breakfast a notch or two, but keep it healthy too with its selection of flavoured granolas, peanut butters and cereal bars. Started by breakfast cereal junkie, Shruthi SA, Jayanagar-based Purple Hippie Granola makes ordinary granola rather delicious with twists. In a quest for better health for her family, Shruthi decided to work on the humble granola and make it interesting with versions such as the Cinnamon Chocolate (granola with roasted almonds and raisins covered in chocolate and perked up with cinnamon) or Peanut Butter and Chocolate (dark chocolate chunks and salted peanut butter). Want to keep it cocoa free? Then go for the Fully Loaded Granola — apricots, raisins, dates, black currants, almond, cashew, sunflower, pumpkin and flax seeds, all with a hint of cloves and cinnamon. We are hard pressed for choice as to which of Purple Hippie Granola’s peanut butters, we want to wolf down for breakfast. There’s Salted, Chocolate and Honey to choose from. For snacking, there is dark chocolate-coated almonds, fudgy granola bars (apparently granola meets brownie) and even a Fruit & Nut version. All bars are sold in a box of six. The Millet And Coconut bar packs in the energy of foxtail millets with desiccated coconuts and dotted with poppy seeds, cashew, almonds — perfect to munch on post workouts. If you can’t make a choice between the granola bars, then the Moody pack ought to help you with two of a kind packed into one box. All of Purple Hippie Granola’s products are preservative and refine sugar free and are sweetened with natural sweeteners and organic honey. Apart from their store in Jayanagar next to Corner House (what a way to guilt us! ), they deliver across Bangalore withing two days from ordering. 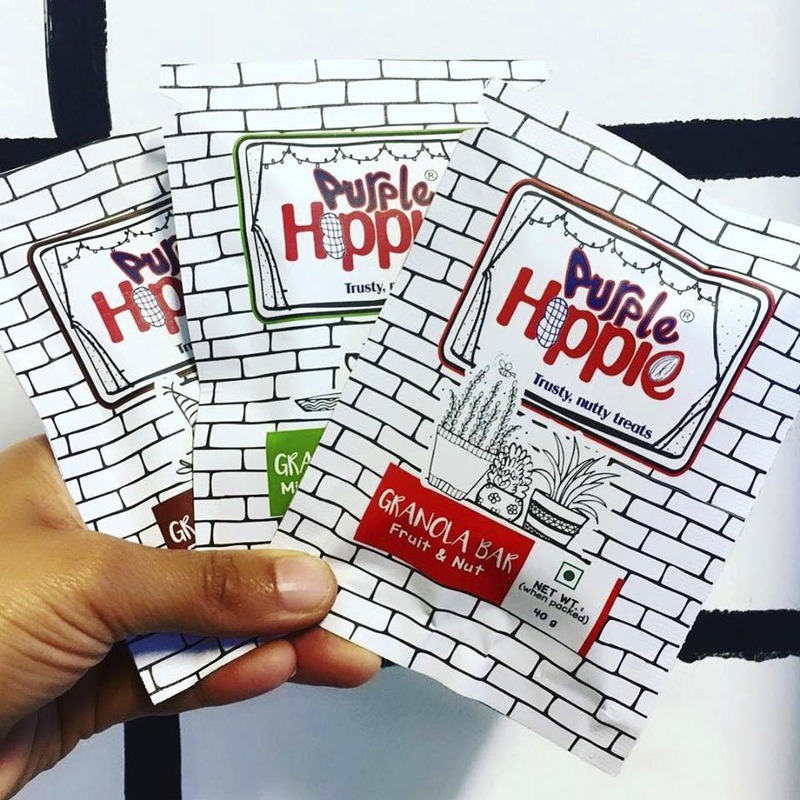 Purple Hippie Granola’s are also shipped all over India. Win. Since all the goodies are preservative free, the shelf life is shorter than store-bought stuff. The grenola bars will last about a month, and the peanut butter a few weeks longer. They're all priced at INR 280 upwards.